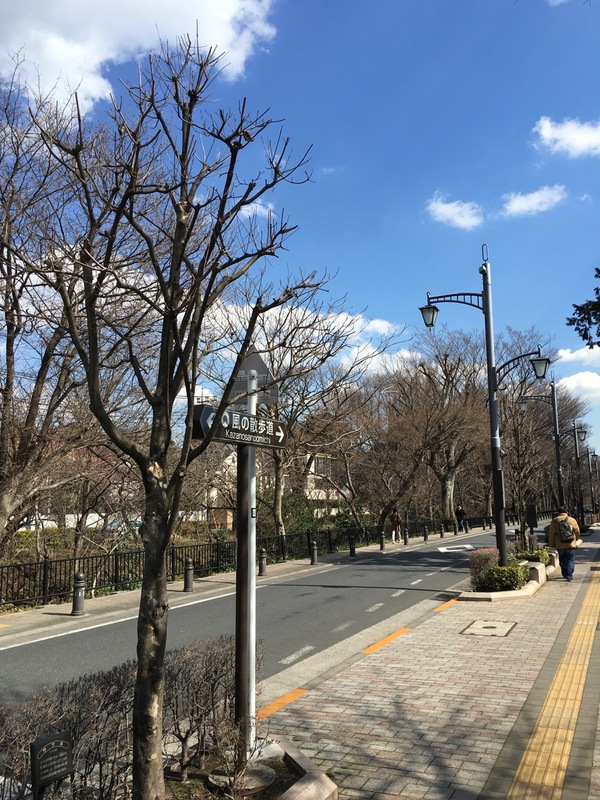 I spent late October 2018 to mid-January 2019 in Tokyo, my longest stay since studying there for ten months in 2002, and it ended up packed with events of Clammbon-related meaning. A lot happened and I have little time to write things up these days, so here’s my attempt to dash through it all. First up was an event in Shibuya for Spoken Words Project, a textile and fashion designer who’s done clothing and album art for Ikuko. 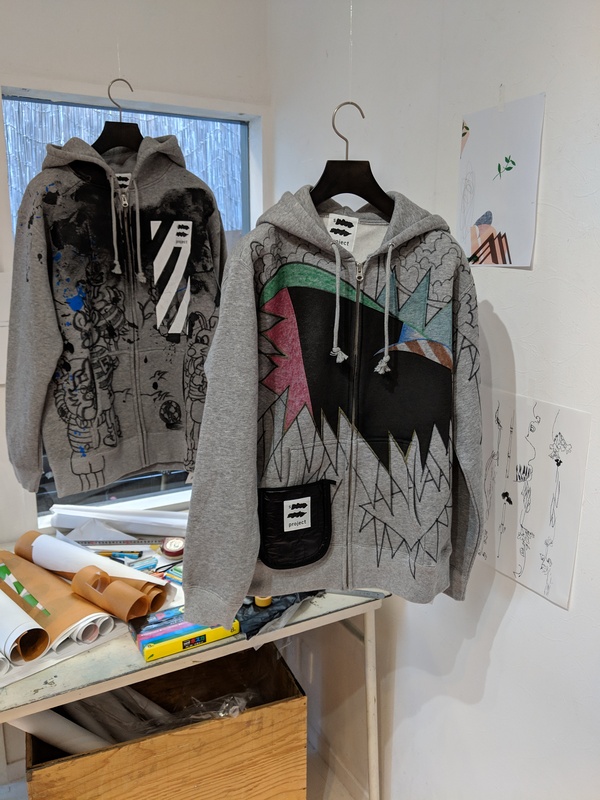 I’d made a number of pilgrimages to find SWP products before, and this time the venue was a hidden-away boutique in a house far from the station. I bought myself a garment right out of what looked like a museum exhibition. Later, SWP made the rare announcement of a new line of backpacks to be released during my stay, which I pounced on as soon as they were posted to the online store. 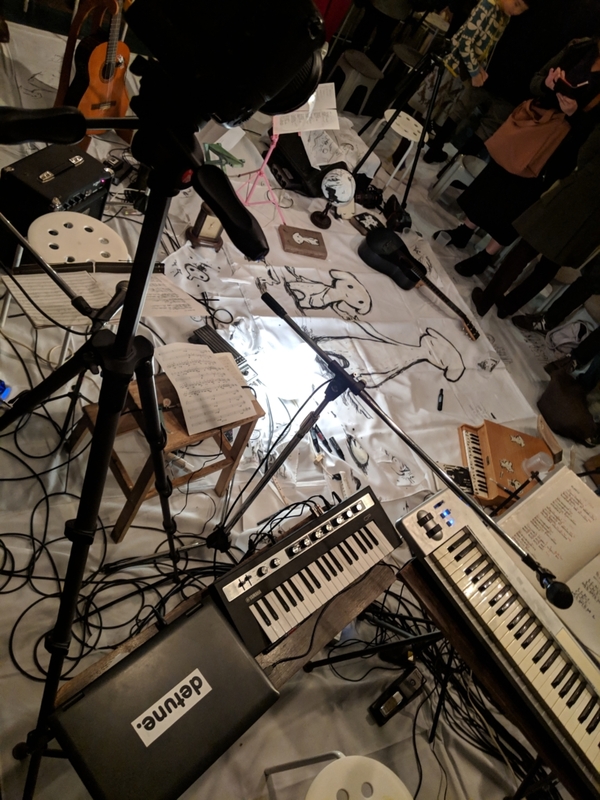 There weren’t any Clammbon shows during my stay, but among the many concerts I did get to attend, a collaboration between Aoba Ichiko and Detune at Harada Ikuko’s cafe Kichimu was the one I looked forward to the most. 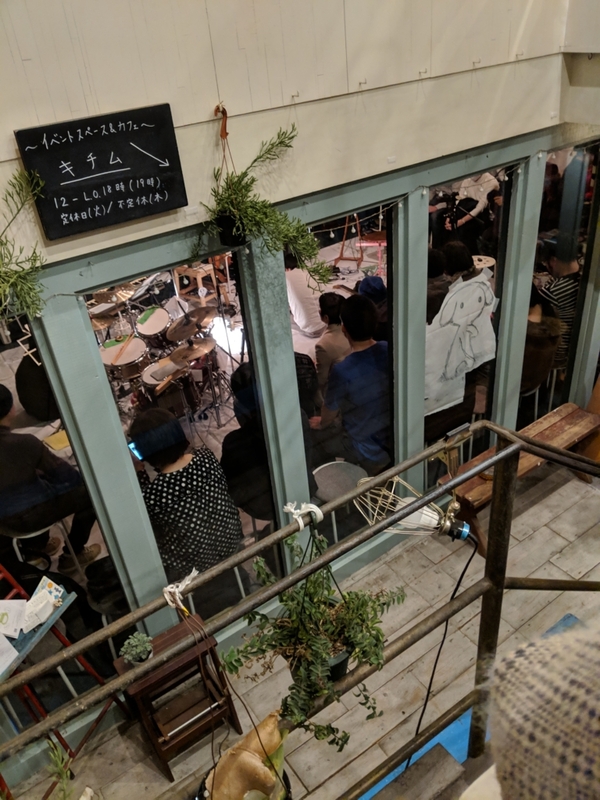 In addition to the two musical performers, the comic artist Nishijima Daisuke was also on the bill, though it wasn’t clear how he would participate until I arrived at the cafe. The place was decorated with his drawings, and the floor was papered with a huge sheet for him to draw on. He sprawled drawing in the center of the floor, Aoba and Detune performed in a circle around him, and the audience sat all around them. The show was whimsical, emotional, meditative, and one-of-a-kind, much like the Aoba Ichiko / Tenniscoats performance I’d seen on my last trip. For one of the final songs, Ichiko encouraged the audience to sing along. But when it became apparent that most people didn’t have the words memorized, Harada Ikuko herself materialized to teach us on the fly, line by line! That was a special moment for any Clammbon fans in attendance, which given the close-knit scene was just about everyone. 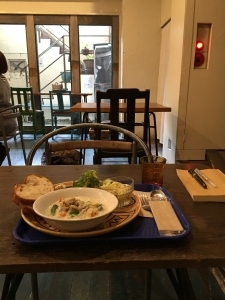 I’d been to Kichimu a number of times before, always with the vague notion that Ikuko might be around at her own cafe, but this was my first time seeing her there. Of course it occurred to me that I could seek her out after the show and try to convey some semblance of the meaning she’d brought to my life over the last twenty years. But I was also highly aware that doing so could very well be a bother, that she was present as herself rather than as the person from Clammbon, and that she’d probably heard the same sentiments from countless people who’ve caught her in moments when she dared to venture out among the crowd. So I resolved not to approach her, and to just appreciate the close encounter of being in a tiny room with her and maybe eighty other people for such a rare event, when I’d only ever seen her onstage or at a formal signing. As I hung around the shop area, looking for a chance to perhaps get a record signed, someone approached me and poked at my tote bag — it was Ikuko, declaring the name of the brand: “Spoken Words Project!” Of course she recognized the artist she’d worked with, and took it as a cue to start a conversation and help make a guest feel welcome. We talked for a few minutes, during which I think I kept my cool quite respectably, but I couldn’t help steering the topic toward what a big fan of her and of Clammbon I am. She was friendly, appreciative, and gracious, and after a while she called Ichiko over to sign the record of hers I’d just bought. I chatted with Ichiko a bit, too, and then headed home. Almost immediately I wished I’d kept the conversation with Ikuko away from a celebrity / fan relationship and simply stuck to topics we shared, like appreciation for the show we’d just seen or admiration of the SWP brand. But I knew I shouldn’t complain or obsess about it, and I did my best to just be grateful that it had happened at all. A few weeks later, I attended another event at Kichimu: the closing party for an exhibit of the noren paintings that Yamauchi Masumi makes for display on Ikuko’s keyboard at each Clammbon performance; she’s made one for every show of theirs since the beginning and is thus the most consistent creative contributor to Clammbon outside of the three band members. I expected the place to be swarming with Clammbon fans, but when I showed up it was just a cluster of maybe ten friends drinking around a table, one of whom I quickly gathered was the artist herself. 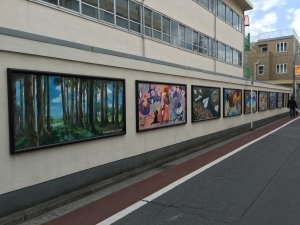 I wandered around the place and admired the artwork, wondering whether it would be best to try to politely join the group or to just wait and see if anyone approached me. Pretty soon I could overhear that the group was discussing whether they should send someone over to talk to me, and wondering whether I spoke Japanese at all. Masumi came by and tentatively introduced herself as the artist; once the conversation got going and it was clear that there wouldn’t be a language barrier, we talked quite a bit and she got it out of me that I’m a huge Clammbon fan, that I’d learned a lot of my Japanese by translating their lyrics, and that I run this very website. She hauled me back over to the tables to sit with the group, and for a while my strange story was the main topic of conversation. I got to know everyone there, including two other ordinary Clammbon fans who’d also showed up alone. It was a rare occasion of making perfect strangers into genuine friends, in a second language, via a shared interest. Masumi checked her phone and casually informed me that Ikuko was a bit delayed but on her way over! (I’ll never be sure, but it certainly seemed like Masumi had texted Ikuko something to the effect of “are you still planning on coming to the party? there’s someone here you should meet.”) Having just heard all about the extent of my Clammbon fandom, everyone turned to see my excitement and nervousness. One person joked that they’d have her sit right next to me. The scheduled time for the event was nearly over, but it seemed that the night was just beginning. I sheepishly canceled the dinner I’d planned with a friend in Shibuya so that I could stick around. Ikuko arrived and Masumi gave her the whole background — it was sort of a perfect way to communicate how much Clammbon has meant to me and how much I’ve done to evangelize them to the world, without having to corner one of the band members and explain it all myself. Soon enough I was telling the story of my first trip to Japan, discovering Kimi wa Boku no Mono and hunting it down at the record store even though I barely knew a word of Japanese. 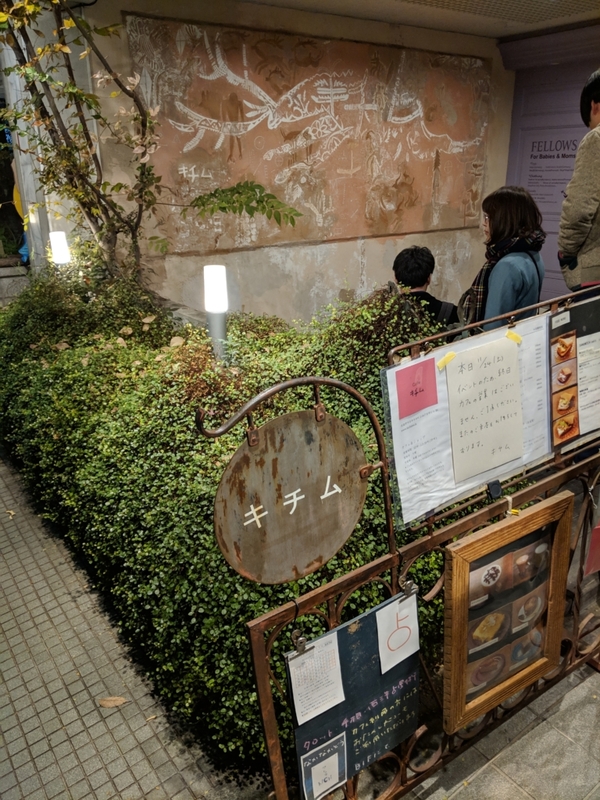 The night went on with a friendly vibe, everyone drifting around between the tables and the art displays, a dozen or so people just hanging out with Harada Ikuko of Clammbon and this oddly devoted foreign fan, talking and joking as one big group, no big deal. I exchanged contact info with the other two fans. Masumi and Ikuko offered to take a photo with us. 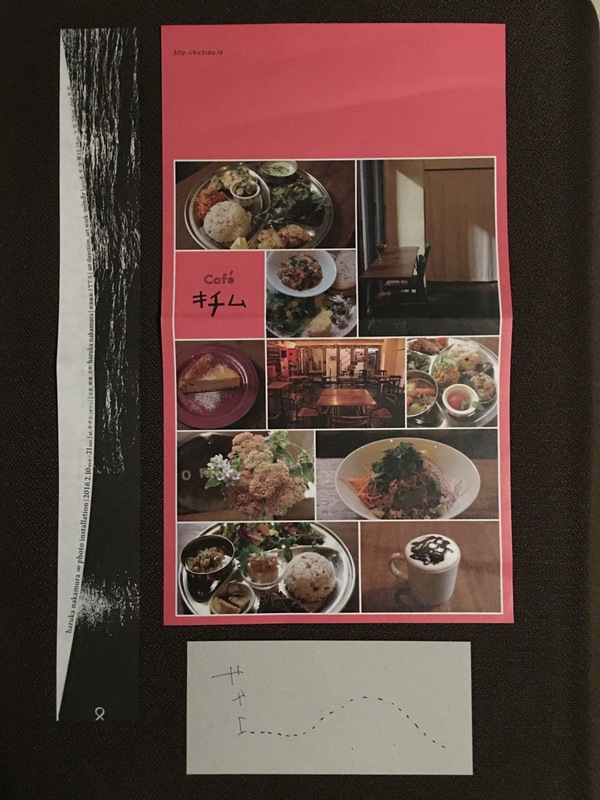 Ikuko handed me a flyer for an upcoming “night market” at Kichimu, and invited me to come back then and say hello. One of the other fans and I rode together on the train, as somehow within Tokyo’s colossal transit system we lived only one stop away from each other. Of course, I came back a few weeks later for the night market; I wasn’t about to turn down a personal invitation from Harada Ikuko. It was a sort of miniature flea market, with tables of clothes, books, housewares, tchotchkes, even someone’s vintage synthesizer collection. I weaved my way around the crowded space, admiring the truly random assortment of stuff that occurs when friends of Kichimu get together to empty out their storage, until Ikuko found me. She greeted me like an old friend: “Ah! You made it!” and gave me a little welcome and explanation of what was for sale. One thing she made sure to point out was a box of seat cushions left over from Clammbon’s performance at Ryougoku Kokugikan. 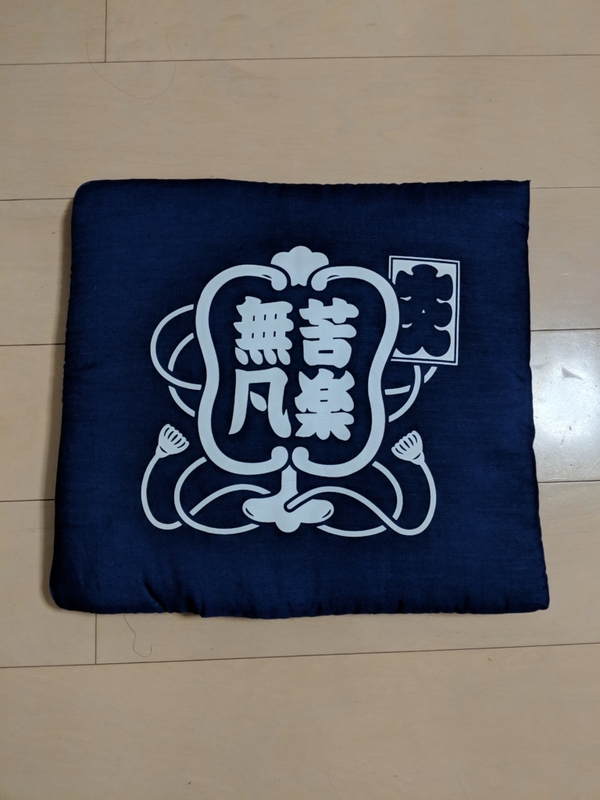 She proudly explained how they were specially designed to complement the sumō arena venue, pointed out the phonetically-contrived traditional kanji Clammbon logo and the nuances of the ōiri sign, and demonstrated how it also becomes a tote bag or a makeshift umbrella. A steal at five hundred yen. When I looped back around to buy one, Ikuko introduced me to her manager as a Clammbon evangelist to the English-speaking world. I happily accepted her personalization of the cushion, stopped by a kids’ clothes table to get some outfits for my kiddo, and headed home. It took almost twenty years, but I couldn’t have asked for a better series of events to become acquainted with a Clammbon member. Somehow I got to have a number of conversations with Ikuko, tell the story of how I came to discover Clammbon and what I’ve done to share their music with the world, take a photo together, receive a signed item dedicated to me, and be invited to sell their records — everything a fan could want — and all without approaching her myself, requesting anything, or otherwise acting like a fan. Instead, her friendliness and openness, and the enthusiasm of the little community around her, allowed it all to happen naturally. After that, there was one more Clammbon-adjacent event in store for me. 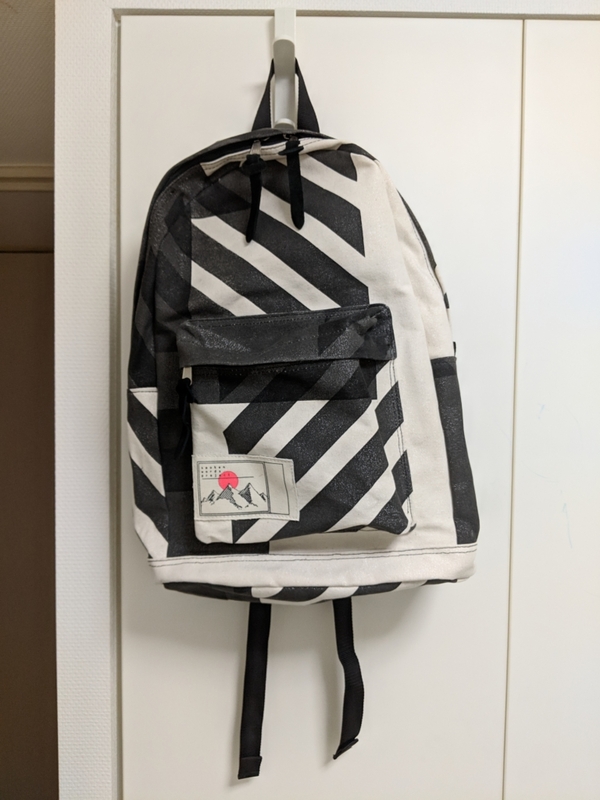 Before this trip to Japan, I’d decided that it was finally time to own a piece by ka na ta, a fashion designer who has done Clammbon’s wardrobe for a few tours and has been otherwise closely affiliated with the band in a variety of ways. His style fit precisely with what I wanted in a coat, and the Clammbon connection would make it that much more meaningful to own. 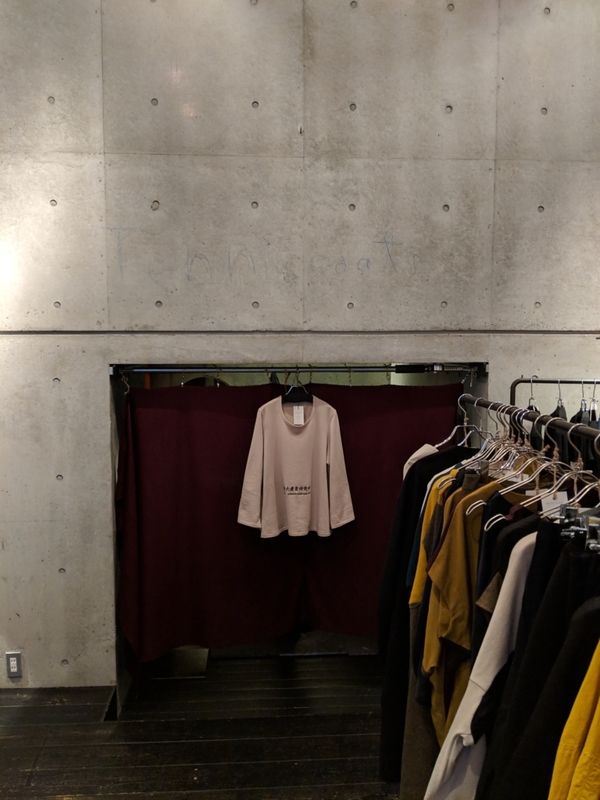 I made the 30-minute walk from Shibuya Station to the residential area where an unmarked basement door leads to the ka na ta showroom. A kind staff member helped me try on some coats and made friendly conversation about our shared tastes in music. 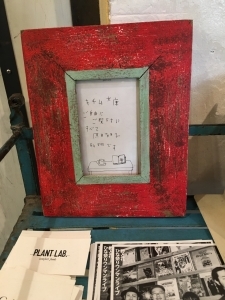 In fact, I spotted that Saya from Tenniscoats had scrawled the band name on the concrete wall of the shop when they had played a tiny show there — another link in the close-knit community around Clammbon and associated artists. One coat would be about three months’ discretionary spending, so I promised to think about it and come back soon to choose one. Near New Year’s Eve, the ka na ta Instagram account announced that the designer himself would be running the shop for a few days, to allow the staff to have the holidays off. 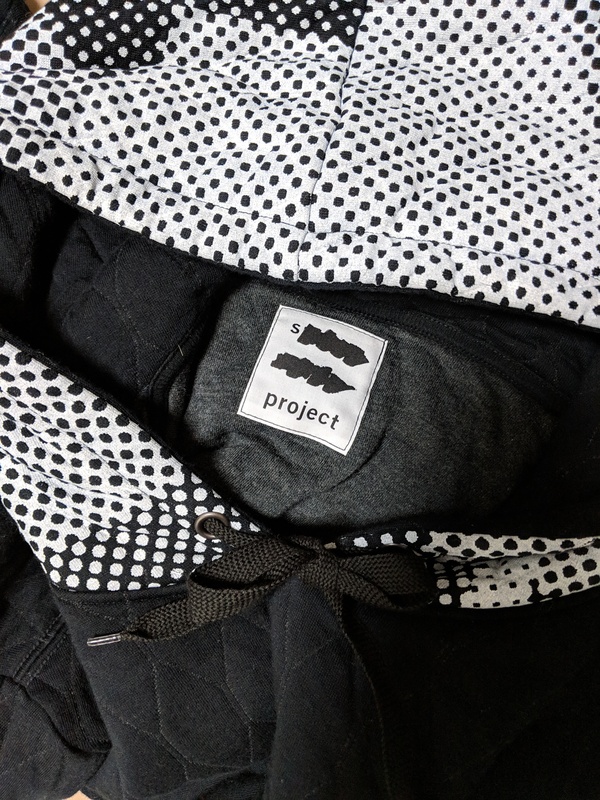 It seemed like a rare chance to meet the designer and finally choose my coat. I journeyed back to the shop and ended up spending a long time there with him indeed, sipping tea, talking about bands and travel and such, and ultimately choosing the mods denim coat! That’s as short as I can make this story. The trip was overall one of the most meaningful and memorable chapters in my life, and the Clammbon thread was a special highlight. Thanks for reading! Clammbon has announced another tour for this year and a third direct-sale release, Moment e.p. 3! These “farm-to-table” albums are hard to get ahold of for anyone outside of Japan; personally I’ve had to call in favors and wait for people to have time to mail them out, but they’re some of the best music the band has ever made. 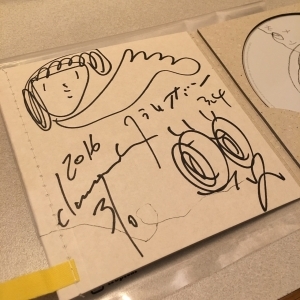 It was certain that I wouldn’t get to Japan this year, and that I’d miss Clammbon’s tour, the one where they were selling the new album that couldn’t be bought in stores. And the signings they were holding at certain shows. And, uh, my brother-in-law’s wedding. But at just about the last moment, several events unexpectedly lined up and a trip actually made sense. We went for it. Normally for such a tour, I’d try to get a ticket for a show in Tokyo, my home base. But by the time I knew I was traveling, The Club Quattro Shibuya show was sold out. So, plan for a long train ride. Shizuoka? Nagano? The best option ended up being the city of Mito, in Ibaraki prefecture. (It helped, in my meaning-seeking brain, that the city’s name is a homophone for the name of a Clammbon member.) 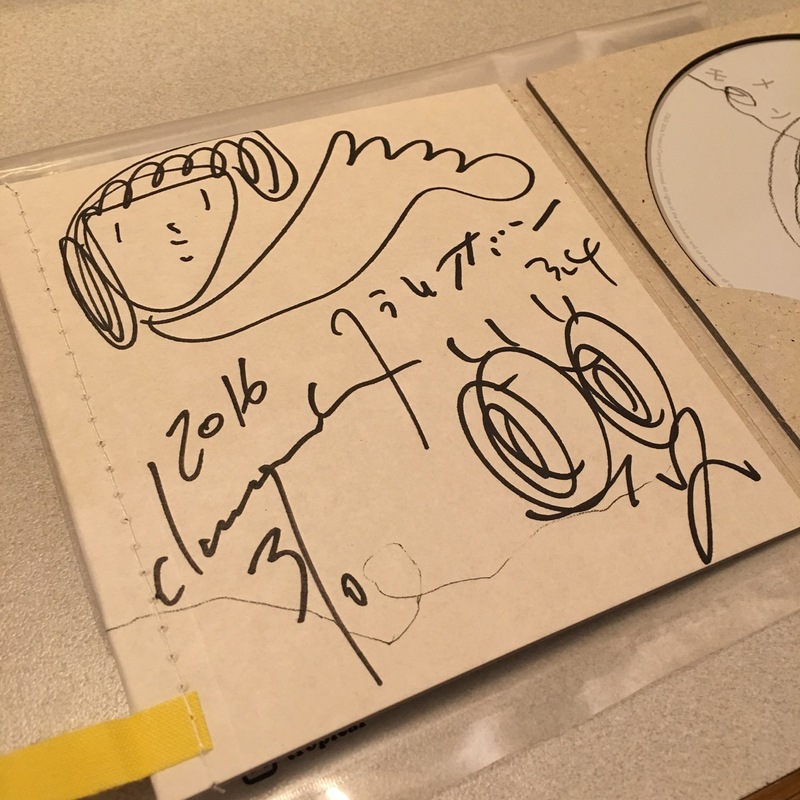 And unlike the Tokyo show, it included a signing! A quick video call to Tokyo; my father-in-law stepped out to the convenience store and came back with a ticket all while while the Skype line was open. 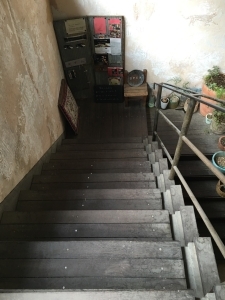 Harada Ikuko owns a cafe in Kichijôji, Tokyo, called Kichimu. Somehow I’d never made a pilgrimage to this place, sure to be special for a true Dramaticker. This time I was determined to do so. When I sat down in the cafe to await my lunch, I opened my notebook and wrote, “Every surface in this place exudes the playful, peaceful Clammbon spirit.” After my meal, I continued, “That soborodon was one of the best things I ever ate. The piping hot rice, crunchy stuff, peanuts, lime, spicy sauce that they warned me about and then I used it all… I could eat that every day.” Indeed, weeks later, I still find myself craving it. It was my first full day in Tokyo on this trip, and the last day of the Haruka Nakamura photo exhibit. 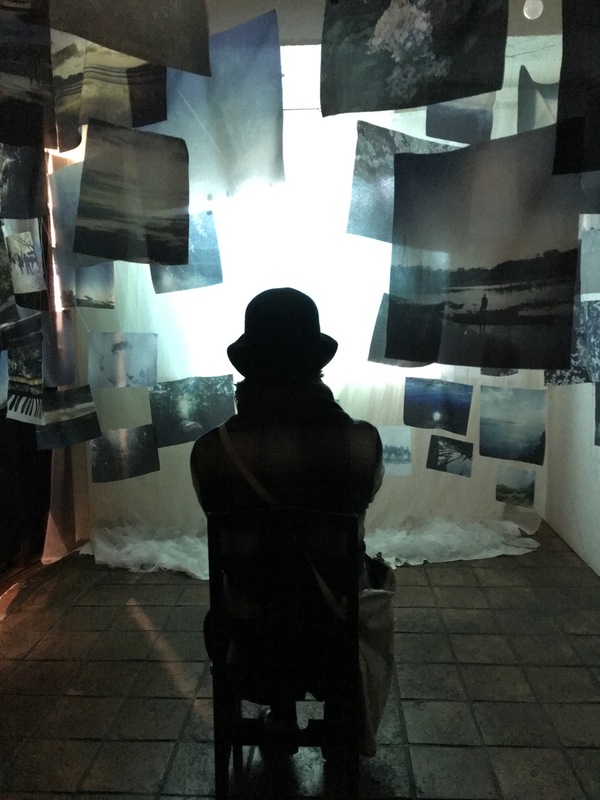 They were playing his album Ongaku no Aru Fuukei throughout the space, and an area of the cafe was sectioned off with black curtains for the installation. 音楽のある風景 – haruka nakamura PIANO ENSEMBLE (Official MV) from KITCHEN. LABEL on Vimeo. The exhibit was titled ∞. It featured 88 photos, printed on fabric, suspended in a figure-eight that you duck into and view from the inside. One photo at a time was also projected onto a wall of diaphanous fabric strips. The combination of the translucent photos, ever-changing projected light, and viewers moving through the space made for an ethereal, ever-shifting experience befitting Nakamura’s music. 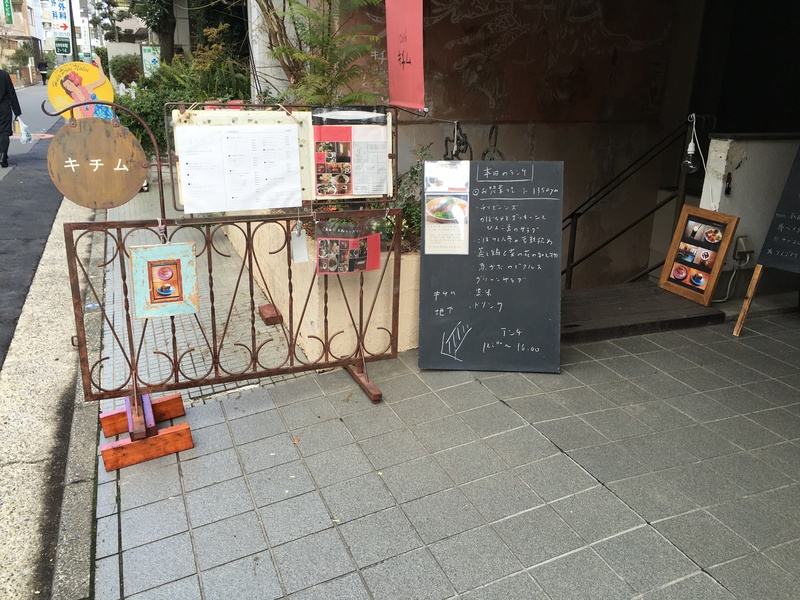 A the front of the cafe is a tiny shop area with a selection of art, jewelry, books, CDs, and so on, all related to or curated by Ms. Ikuko. 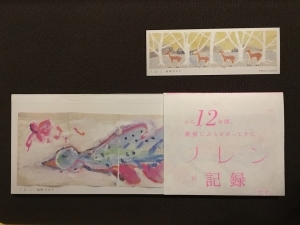 After carefully scrutinizing every last item, I chose a book collecting the Yamauchi Masumi paintings that Ms. Ikuko has hung from her keyboard over the years, and a set of postcards by Kitamura Norichika. I couldn’t stay away. On a free afternoon the following week, with that delicious soborodon still hovering in my mind, I headed back to Kichijôji. The Chûô Rapid Line train took me a stop too far, to Mitaka, but walking one station back seemed like a fun idea. It was — the area between these two stations is just lovely. 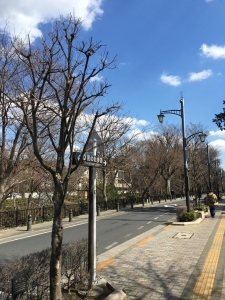 Tree-lined residential streets, boutiques, galleries, the huge Inokashira Park, and even the Ghibli Museum. It all has a more artsy and cheerful feel to it than other upscale neighborhoods like, say, Daikanyama. On this second visit, the music selection was raw, rootsy folk standards. I discovered from a sign on the wall that for the entirety of 2016, apart from special events like the Nakamura exhibition, music in the cafe was selected by the band Tenniscoats. This about knocked me over because just a few days earlier I’d discovered (and met) Tenniscoats at their very intimate collaboration concert with Aoba Ichiko. That show was a very special experience indeed, and a story for another time. 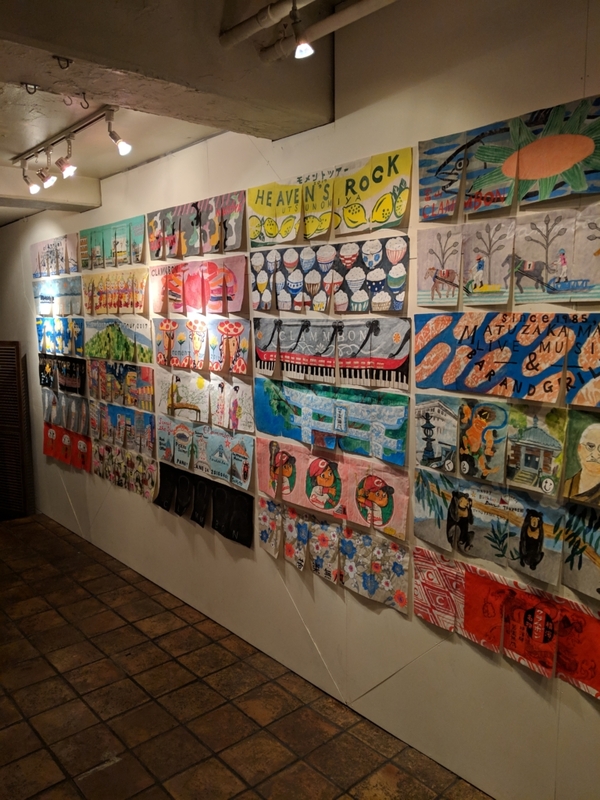 When in Shibuya to meet up with a friend, I did make my regular trip to Desperado to see if there was any Spoken Words Project. The excellently-attired fellow there advised me that all they had was one dress, and that they were expecting new pieces soon. He was curious how I knew of the label, so I explained the connection to Clammbon and to Harada Ikuko. 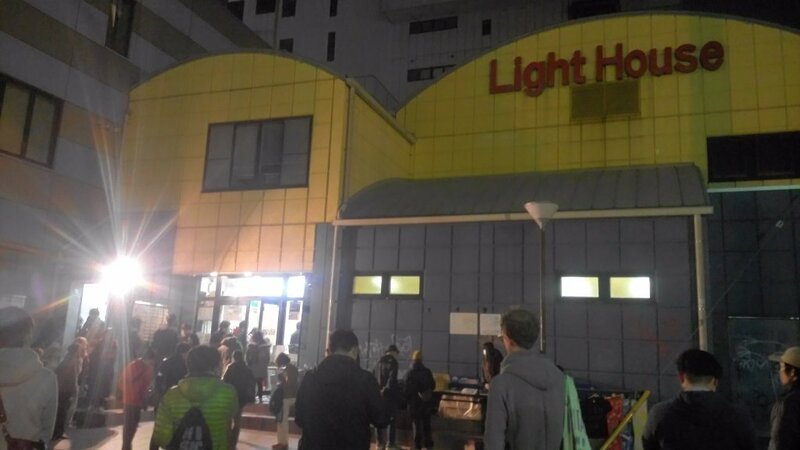 The cushy, 100-minute Hitachi-gou express train took me from Tokyo to Mito, the capital city of Ibaraki prefecture, on the day of the concert. I had most of the day to explore the city, and I came to love its micro-Tokyo charm. (You can wander Mito with me on Instagram.) The merchandise tables opened at 17:00, outside the venue — an important detail on this particular tour. Clammbon is experimenting with an increasingly self-contained and self-sustaining business, to the point that their latest CD, Moment, is available at concert merchandise tables but not at record stores nor on the internet. I withdrew some extra cash at the 7-11 on the corner, a comically simple process compared to the ordeal it used to be to get cash from a foreign account in Japan. The staff confirmed that I could buy as many copies of the CD as I liked, so I picked up one for myself and three for friends. Plus a T-shirt designed by Ka na ta, a brand that the band has been wearing on stage lately and that has a showroom at Kichimu. 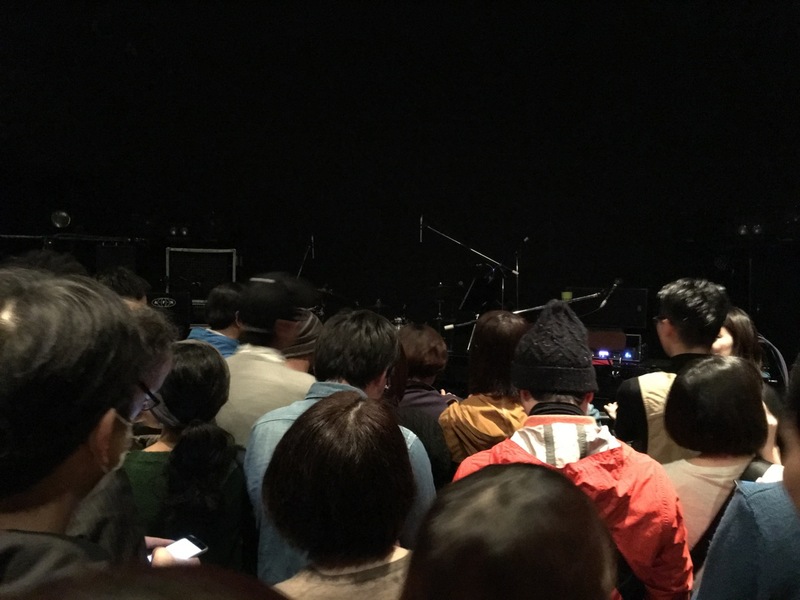 Audients waited outside in the cold, around one of the city’s several statues of the legendary feudal lord Mito Kômon, and were let into the standing-only venue one by one according to the letter and number on our tickets. The staff person called out A1, A2… up to A150, then B1, B2, et cetera. My ticket was… C117. Quite close to the end of the 350-person capacity. But a lot of people had gone up to the balcony, and near the back of the floor was still quite close to the stage indeed. We were really crammed in there. Several times the staff asked us to all take a step forward, when we were all already closer together than if we’d been on a rush hour Yamanote Line train. Within minutes it was sweaty hot. Once the lights went down and Clammbon took the stage, Mito high-fiving Mito, of course nobody cared. Official photo from Tropical. I’m visible on the right! For a few favorites — “Surround”, “GOOD TIME MUSIC”, “Chicago”, and “Re-Aru Kodou”, I believe — the audience was lit so that the band could see and interact with them, just inches away. The first words that Clammbon had to say to us were from Ikuko: 近い。どこ見ればいい？慣れよう。 — “So close! Where am I supposed to look? I have to get used to this.” Several times it felt like Mito or Ikuko was smiling directly at me, absorbing my enthusiasm. Were they really…? 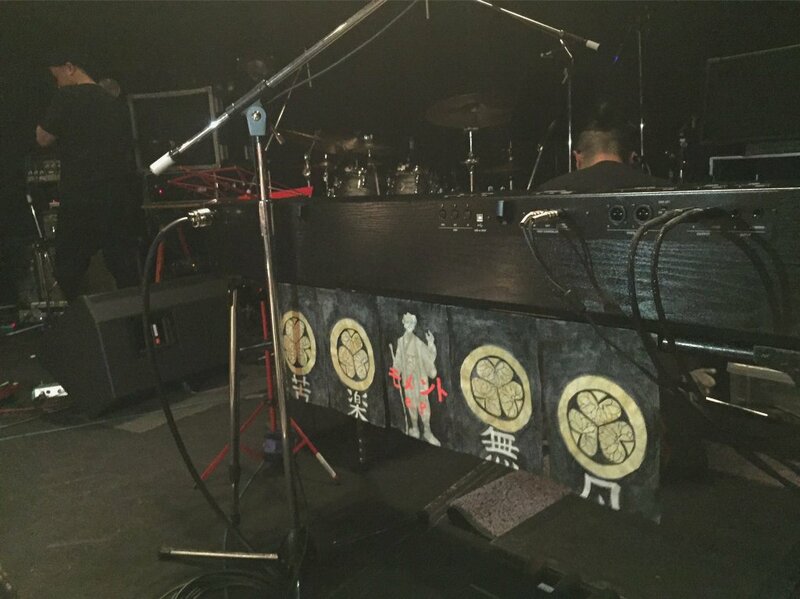 “Re-Mellotron” was a first for this tour, and the one unusual choice considering its theme of January snow. “Yet” was the sole song from triology, though I’d been hoping to hear “Agitator”. “KANADE DANCE” served its usual role as a sort of centerpiece. And the set included the entirety of the new EP, Moment. In the spirit of getting closer to their fans, The band spent a lot of time chatting with the audience. After some banter about the intonation of Mito the musician versus Mito the city, the first chat session was largely about their experience in the music business and their experiments with opting out of the normal way of doing things. Mito gave a breakdown of where the retail price of a major-label CD goes — recording, marketing, manufacturing, distribution, sales, &c.… In the end the artist gets 5%. But after 20 years of building their business, Clammbon can do a lot of that themselves. They can record at their own studio. They already have dedicated fans, and their side projects get their names in articles and on TV, so there’s no need for the big marketing budget. (Mito does a lot of anime music, Daisuke is teaching, and Ikuko does commercials.) And instead of selling in record stores, why not bring the CDs along and sell them at the shows, if they’re touring across the country anyway? Ikuko likened the model to farm-bought produce. She loves lotus root (Mito: “Last time it was carrots!”) and she found that she could get it fresher and cheaper by buying it at the farm. Plus the bonus of seeing the place it came from and meeting the people who grew it. A big part of the idea is for people to come to the show, hear the fresh new songs, and if they liked them, buy the new CD. The model seems to be working — the farm-direct Moment has made as much profit as if it had hit (I believe) #4 on the Oricon chart! In contrast, triology reached #13, and Clammbon’s highest chart position ever was #11, for 2010. Where does all that money go? Mainly back into the music: high-end equipment, studio space, &c.
The second chat session was about finding more places to sell the CDs. At first the idea was that they’d be for sale only at venues on the day of a concert. But over time local businesses — cafes, restaurants, clothing shops, galleries, and even a few record stores — have been carrying it too. There were survey forms at the show, with fans invited to submit ideas of eclectic places that might be willing to sell the CD. 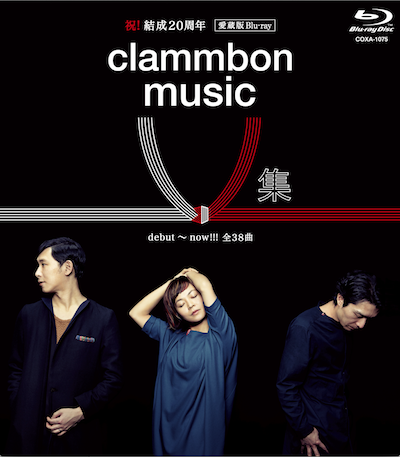 Lately the official Clammbon Twitter account has been overflowing with announcements of shops carrying the album. Mito joked that maybe they should have called this the “Where Shall We Sell” tour, in the spirit of their past “Where Shall We Play” tours. 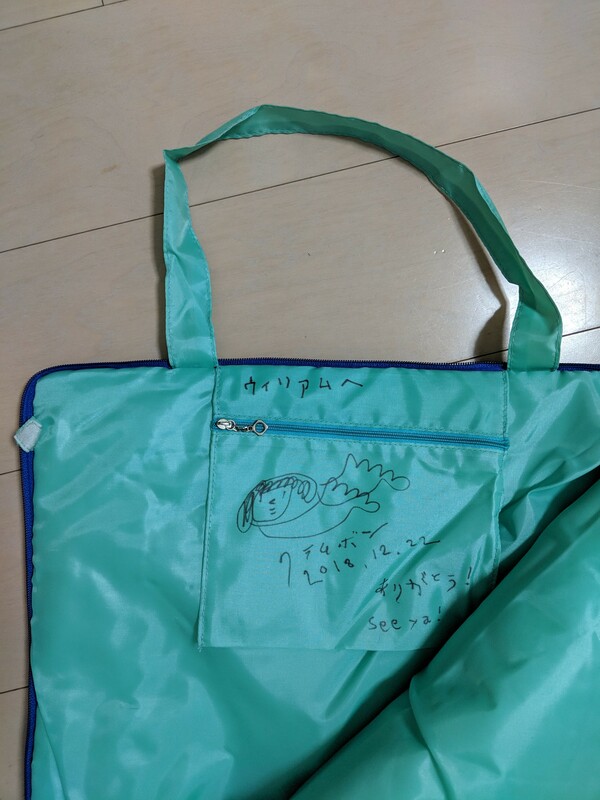 Clammbon had recently written and recorded the ending theme for the new Shinkai Makoto anime She and Her Cat, which Mito explained that they couldn’t play live yet, because it was just airing for the first time later that night. One audient informed Ikuko that it wouldn’t actually air in Ibaraki until two days later, so we couldn’t go home and watch it just yet. It was a little strange for the encore to consist of two new songs, and for there to be no “Vital Sign”, but it was important to the band to play us the entirety of their new CD so that we could judge for ourselves whether to buy it. Plus, time was limited as there was still a signing to do! The new songs were captivating, and covered a wide range of styles and instrumentation. The audience was just as enthusiastic for this new and unfamiliar material as we were for the old favorites. A very special Mito Kômon noren for Ikuko’s keyboard, by Yamauchi Masumi. Photo by @tsubametachi. For the signing, everyone was sent back outside. This was a perfect time to redeem the mandatory drink ticket you paid ¥500 for on the way in, but didn’t have time to redeem while rushing to get a good spot. A cold Yebisu under the statue of Mito Kômon was just the thing to cool down from that sweaty room. Anyone who bought merchandise and had a ticket to the show was given a card with a number on it; another number-calling ritual began. My number — 92, I think — was called. I went. Just inside was a little table, and Clammbon was there. Sitting here in my bed in the USA now, typing this on my phone, my mind stumbles, trying to believe it. But I have the memories. I have the tweets. And of course I have the autographs. First was Mito. He about fell over when he saw my Dramatickers shirt. Ikuko greeted me with a huge, excited smile and wiggle, as if she’d been surprised at work by an old friend. “That’s great. I was watching you.” She pointed to her eyes and then to me. “I saw you singing.” She flapped her hand like a puppet. That was it. My dumbfounded banter may have been weak, but the atmosphere was of gratitude and joy. The band made an effort to make everyone feel welcome and appreciated, and every face was smiling. And while I didn’t want to slow down the line by talking about this site, it was gratifying to have been seen and acknowledged, to know I’d made a small impression. Perhaps when I write in to request consideration for foreign fans as they develop their direct business model, I can mention that I was the foreign fan in the classic shirt at Mito, and they’ll remember. That would be nice. 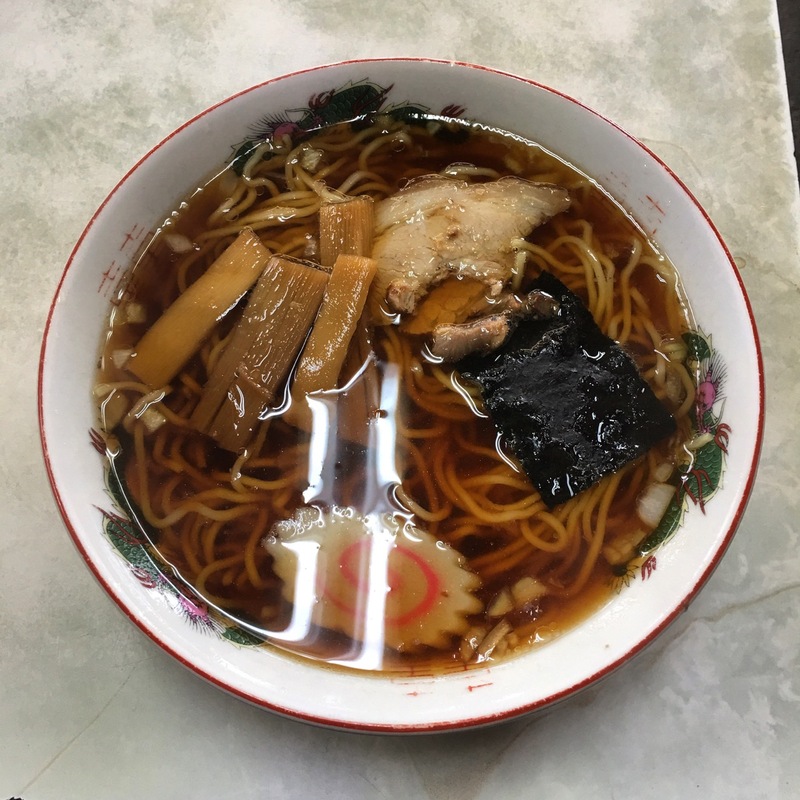 Mito’s love for noodles is well-known; he appears at various ramen establishments in the band documentaries and on social media, sampling each city’s best offerings over the course of a tour. When during a chat session he mentioned that he’d been to a place called Chûkasoba Suzuki that day, the crowd murmured approval. So the next day I hunted it down. 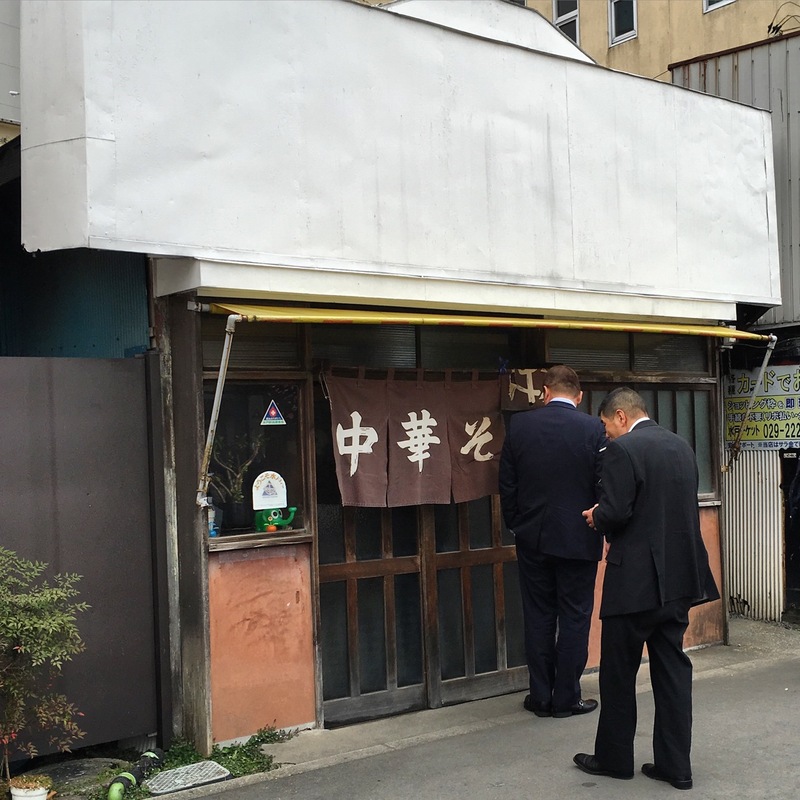 The place is barely labeled; just a fabric drape in front of the doors that says 中華そば — “Chinese noodles”. I gathered the courage to go inside, where a woman who very well could have been there since the place’s founding in 1960, said, ラーメンしかないけどそれでいい？ — “All we have is ramen, you want some?” I agreed and sat at a tiny table, surrounded by patrons of advanced age slurping their noodles and saying nothing. A man gave me a nudge and quietly encouraged me to use the stool at his table to set down my bag. Eventually my ramen showed up: the most standard, classic bowl of it you can imagine. It tasted perfectly ordinary. I brought the bowl to the lady when I was done, as I had seen others do. She accepted it and unceremoniously asked me for ¥250, about $2.25. I handed her the coins, which she took with one hand while stirring a pot with the other. It was an experience to remember. But it was not especially filling. Ninety minutes later I had a big bowl of shio châshûmen at Ajihei. Hello friends! Things have been tremendously hectic for me lately, so I have barely had a moment to think about the site. (And I am not ignoring your emails!) But there has been some news in the Clammbon world. Right now the band is in the midst of the awkwardly-titled Venue-Sale-Only Mini-Album Tour! 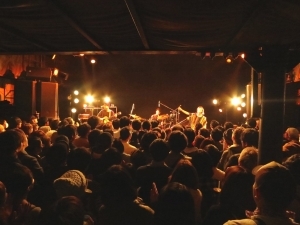 The five-song EP, titled Moment, can only be bought at a tour venue on the day of a concert. Some shows include a signing, at which anyone who has bought a qualifying merchandise item can meet the band and have it autographed! I was pretty broken up about this whole thing, when I thought there was zero chance I could go. But a lot of circumstances aligned such that I’m taking off for Tokyo tomorrow, and on March 4 I’ll be making a one-night excursion to Mito city in Ibaraki prefecture for a Clammbon show, with signing! There are some other Clammbon-related excursions planned for this trip, too. Stay tuned for updates! 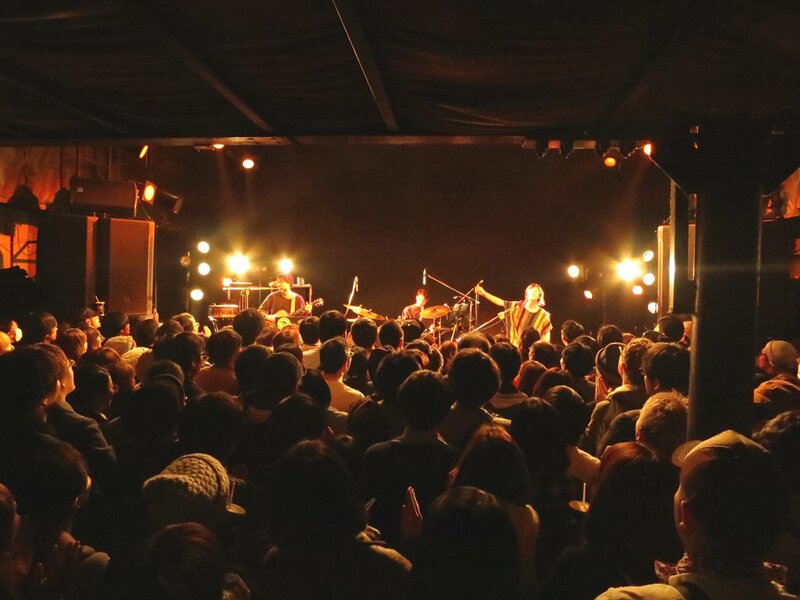 Clammbon has released a lovely trailer leading up to their big tour finale at Nippon Budôkan. Really, really wish I could be there! And I hope all this high-quality footage suggests a third documentary film, or at least a concert video. Also! I didn’t see this go by on the official band site, but apparently Warner is issuing remastered editions of the first five Clammbon albums. They come in deluxe paper sleeves, with some bonus tracks; either songs from maxi-singles or live tracks. There’s been some trouble with the production, though, so they’re delayed until further notice. This is the Dramatickers Dot Com soft open! The real grand opening is coming later this week [update: this turned out to be a lie], but if somehow found your way here early, you are welcome to follow along as we get everything in order. Clammbon has been appearing on the radio show The Hangout, one member at a time. The most recent episode features Mito, and Ikuko’s episode includes a performance including “Kawaru”, the song that they introduced on Ellie’s TV show Artist a couple of years back. And don’t forget — triology comes out in just one week! It is totally sneaking up on me. Hi friends! Clammbon’s first new song in 2½ years is out now! This is an epic-sounding tune with strings arranged by none other than Yoko Kanno. You can get it at iTunes Japan, Ototoy, or on CD. The band will be playing some very special live shows around Japan this month, where folks who bought the single on CD will have a chance to get it signed! I have been hard at work on Dramatickers dot com, which is why there has not been much activity around here. The idea is to launch the new site some time between the announcement and the release of Clammbon’s next album. It sounds like the band is really ramping up on announcements lately, so here’s hoping we will hear about it soon! Ninth Album Recording Has Begun!!! Today I got my copy of Clammbon Guide Book, thanks to my friend Josiah (who you’re going to be hearing more from pretty soon). It’s superbly detailed, the quality is impressive, the included extras are fun… it even smells good. But I wanted to hurry up and translate the short little interviews with each band member that appear at the beginning. Let’s see if I can get through them all here in bed before I go to sleep. When and how did you start playing? I start learning classical piano at age 4. I give up at 14. At 16, I’m blown away by jazz piano. I start again. I go to Tokyo and meet the other two members. I arrive at the present. Who are some musicians that influenced you? Thelonious Monk. A pianist I’ve admired and adored since my teens. I still listen to him. The silence when he’s not playing, where the sheet music shows a rest, that’s there i learned the secrets and the richness of music. Nina Simone. She and Monk were true punks. That unwavering groove. A marvelous performer. What are some influential albums that you recommend? What is it like to perform in Clammbon? What are you particular about? What is important? What is unique about it? First, for most of our songs (other than the ones we write during sessions), Mito provides the melody, keyboard riffs, voicing for the harmonies, and so on, the phrases that make up the core of the song. We practice it over and over, making it a part of our bodies. The three of us practice it over and over as an ensemble and make a groove out of it. And as we play it over and over live, we nurture it. And it nurtures us. What do you think as you touch your instrument now, and what do you want to do with it in the future? I really do love touching an instrument. That’ll never change. And yet, I still have a long way to go. I’ve been practicing classical pieces from time to time, and it’s fun, like working muscles you don’t usually get to use. I want to keep taking the time to gradually study, or pursue it, on my own. This phenomenon known as sound. What would you like to say to those who are holding this songbook? As a fourth grader, I was handed a bass and told to play in the back-up band at my parents’ concert. It’s hard because I have a lot to do apart from the bass. I want to go back to music school. I want to properly study things like wind and strings harmonics, and start over on learning orchestration. Starting in fourth grade, taiko drums. Junior high, woodwinds. High school, woodwinds. Steely Dan: Aja. The performance of the young Steve Gadd, Bernard Purdie, and the others is amazing. Kinniku Shoujotai: Sister Strawberry. I listened to this pretty much every day in junior high. I just put my heart into making the best drum sound that I can. No matter how much I try and try, I still have a long road ahead to get to the level I want to be at… so I’ll practice. I’ll be happy if it serves as a reference for you. Have fun! The release date is July 7, but it’s not yet clear exactly where it’ll be available. Sooo somehow the biggest Clammbon news of all time has managed to escape my attention for the past six weeks. The 9th studio album is coming at the beginning of 2015!! I love how they just kinda casually mentioned this huge fact in between a bunch of other announcements. “Clammbon Music V Shuu”, a music video collection, is coming April 2!! That’s like, soon! This is a huge deal. I have long lamented how half of the band’s videos are only available on the rare limited version of Best, and half aren’t available anywhere at all. Now, we’ll get super high quality versions of 38 videos on Blu-Ray and DVD. See the track list at the official page. Plus, it includes an entirely new video for “Binsenka”!! The first Clammbon tribute album is coming this autumn!! Start placing your bets on who will participate. Toe? Husking Bee!? Spangle call Lilli line!?!? A book of Clammbon sheet music is coming!! Some time!! A big fancy 20th anniversary site has gone up with details about all of this lovely stuff, a new official band photo with everyone looking all grown up, and a video in which the band reminisces about their history. A 20th anniversary Twitter account and Facebook page have also gone up. This is a great little clip from a show called Yurunavi back in… wow, 2007! I happened to be in Tokyo at the time, so I tuned in to check it out when it first aired in the middle of the night. It was just a little five-minute thing, but it made a big impression on me. At the time, all I could do was write it up. But thanks to the magic of YouTube, here it is for everyone to enjoy! This really encapsulates a lot of what we find charming about Ms. Ikuko, don’t you think? Particularly her ability to maintain a sort of childish sense of joy. She says in this clip that part of why she likes that old beat-up melodica so much is because it makes her feel connected to her childhood self.